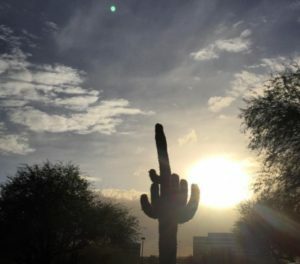 When you mention the term “United States desert,” Phoenix is likely one of the first things to come to mind. The surroundings of this city provide some the most beautiful scenery in the country. 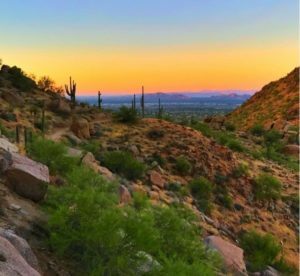 In fact, National Geographic ranks Phoenix among the best places to hike in the United States! Whether you’re a first-timer or a seasoned outdoor veteran, there are plenty of trails everyone can enjoy. Here are six spots both locals and vacationers should consider checking out. 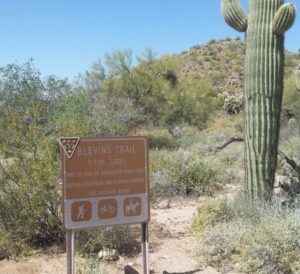 To start off nice and easy, Blevins Trail, located in the gorgeous Usery Mountain Regional Park, is a great way for first-time hikers to enjoy the one-of-a-kind scenery without having to spend too much time looking at their footing. The hike spans across 2.9 miles and provides plenty of opportunities to scope out tangles of ocotillos, giant saguaros, cholla bushes, and all sorts of alluring desert flowers and landscapes. The hike doesn’t usually get very crowded so you don’t have to worry about stopping to soak in the surroundings. Blevins Trail is dog-friendly, so feel free to bring your furry friend along for some exercise! Wagner Short Loop Trail is a flat, 1.6-mile stroll through McDowell Mountain Park. The path gives you exposure to all sorts of indigenous flowers and plants. It’s strongly recommended to do this hike in the springtime to get the full effect. The entirety of the trail is smooth sailing and perfect for a family outing. You can even hop on the bikes to navigate this one! Wagner is also dog-friendly. Some of the highlights of this spot include breathtaking views of Four Peaks (to the east) and Weaver’s Needle (to the southeast). When you get to the Nature Center, take a left turn and there will parking on the right. Pinnacle Peak, in Pinnacle Peak Park, takes you up a quite a way (about 2,750 feet). But, the length of the trail is long enough to where the incline isn’t too steep. The total distance is about 3.5 miles and should keep you occupied for a good chunk of the afternoon. Unfortunately, the hike will not bring you to the granite peak, as the name might suggest. However, there are all kinds of views to gaze at along the journey. Around the half-mile point, you are provided with a panorama of the valley and McDowell Mountain. If you’re into rock climbing, there is an access trail that leads to the summit. Casual hikers are not permitted. Traffic on this hike can get pretty heavy, especially on the weekends. Keep in mind, the trail is not a complete circle, so will need to do some backtracking to return to the beginning. Lookout Mountain Summit Trail is located in the Phoenix Mountains Preserve. Even though this one is relatively short (just under a mile), the hike isn’t exactly a walk in the park. The trail involves ascending nearly 500 feet. While your quads may be burning a little bit once you reach the top, the view will make it all worth it. The Lookout Mountain Summit will give you a miraculous view of the Squaw Peak, Shaw Butte, and way off in the distance, the Phoenix skyline. The trail itself is very well-maintained and marked so you don’t need to worry about getting lost. The foot traffic on the hike is usually pretty sparse. Dogs are allowed on the trail, but only if the temperature is below 100-degrees. The hike should take no longer than an hour and a half. But, if you want to keep going, there is a separate loop trail a little over 2.5 miles long at the foot of the mountain. 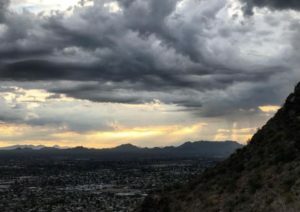 Piestewa Peak Summit Trail, also located in the Phoenix Mountain Preserve, is one of the most popular hikes in all of Phoenix, and for good reason. This one is perfect for more experienced adventurers looking for a fun desert challenge. As awe-inspiring as the views are, it’s not for entry-level hikers. The ascent goes from 1,400 to 2,608 feet and will most likely have you catching your breath once or twice. If you go in the springtime, you will see a myriad of desert flowers, cacti, and ocotillos along the way. Once you start to approach the peak, you will be hiking up a stair-like trail composed of schist rock. 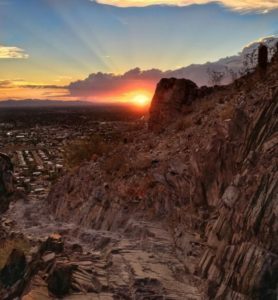 The spectacle payoff of Piestewa Peak entails some of the most astonishing scenic views you will ever witness, with downtown Phoenix in the background. Due to its popularity, you can usually expect a decent crowd on this trail. This trail looks like it’s straight out of Mars. 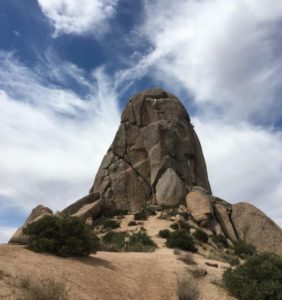 Throughout all the boulder fields and desert flora, Tom’s Thumb, located in the McDowell Sonoran Preserve, is a 4-mile hike that rises about 1,350 feet in elevation. Tom’s Thumb starts off relatively easy. But once you hit the half-mile mark, the skill requirement takes a drastic spike along the ridgeline. Much of a difficulty of this hike comes from a number of rigorous switchbacks, especially if you start on the north side. Throughout the trek, you will be spoiled with wondrous views of McDowell and its surroundings. This hike tends to get crowded, so be sure to stay alert at all times. Most importantly, BRING PLENTY OF WATER! 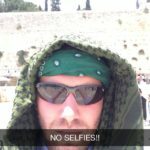 There is none on the trailhead and you will definitely need it. Once you conquer the ridge, the trail eases up towards the summit. If it’s your first time, be sure to grab a cliché picture of yourself giving the “thumbs up” next to Tom’s Thumb! 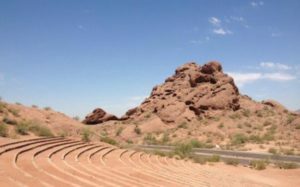 Phoenix is a hotbed for hiking and outdoor activities. This is probably what attracts all the snowbirds during the winter. Regardless of which hike you choose, you will likely find a good mix of locals and visitors. If you’re in the area, it would almost be a crime not to check out one of the many trails. This small list only represents a fraction of the hikes in the Phoenix area. There will undoubtedly be more to come!